Huge News!!! Home Quarter Final Secured!!! Sydney Uni continue to achieve amazing things in 2018-19, and following their win over Campbelltown-Camden on Satuday to remain undefeated in the Limited Overs Cup (full story on Tuesday), University Oval will play host to a Quarter Final grudge match against Penrith on Sunday 17th February 2019. 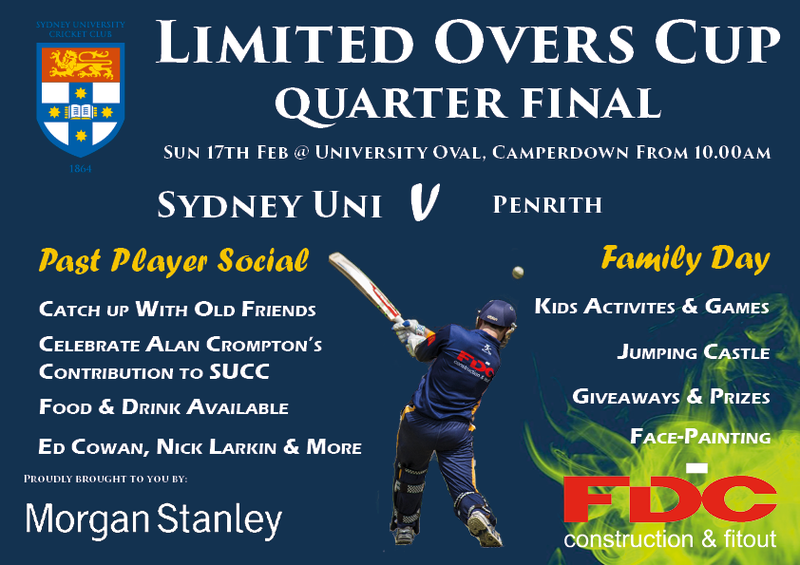 We are very excited to announce that we will be hosting the FDC Construction & Fitout Family Day, and a Past Players Social Event at the Quarter Final, making it the biggest day of cricket for Sydney Uni so far this season. Full details of both events will follow later this week, but for the moment, please put the 17th February into your calendar and join us in what will be an amazing day of cricket, fun and friendships at Uni Oval.